After a 300 mile road trip in 7 hours, Rockets could have begun wearily but were quick out of the traps with a great 4 man move in the opening 11 seconds seeing Sydney Donaldson drive to score, draw the foul and hit the free throw. A J Carr was scoring inside and taking down rebounds as Rockets went 15-8 ahead before Newcastle went on an 18-10 run to ease ahead at the first break 26-25. It was good to see captain Danny Carter playing with much less pain thanks to an injection earlier in the week whilst much is now expected of the confident 16 year old David Chive who matched last week’s best performance with another high score of 18 points. A big Donaldson treble and a Carr spin to score saw Rockets recover the lead but six unanswered Newcastle points assured the contest would stay close and personal. A brace of Newcastle trebles had Rockets five points adrift midway through the second period but Adrian O’Sullivan scored off an assist from Carr who continued his fine run of performances but Rockets had lost the second quarter by 21-24 so found themselves 46-50 adrift at the interval. Trae Pemberton got away from his 2 defenders to hit his one and only treble of the game but it got Rockets off to a bright and rewarding start to the third period as they quickly levelled on 54, 56 and 58 points each. Pemberton had sent an exquisite bounce pass to Carr to continue to trouble the Newcastle defence whilst Donaldson had another very good offensive game as he stroked a pair of trebles, one from a great assist from O’Sullivan . Arinze Emeka-Anyakwo was secure from the penalty stripe and O’Sullivan hit a buzzer beating shot as Rockets had their best quarter with a 29-21 score line to lead 75-71 going into the final quarter. 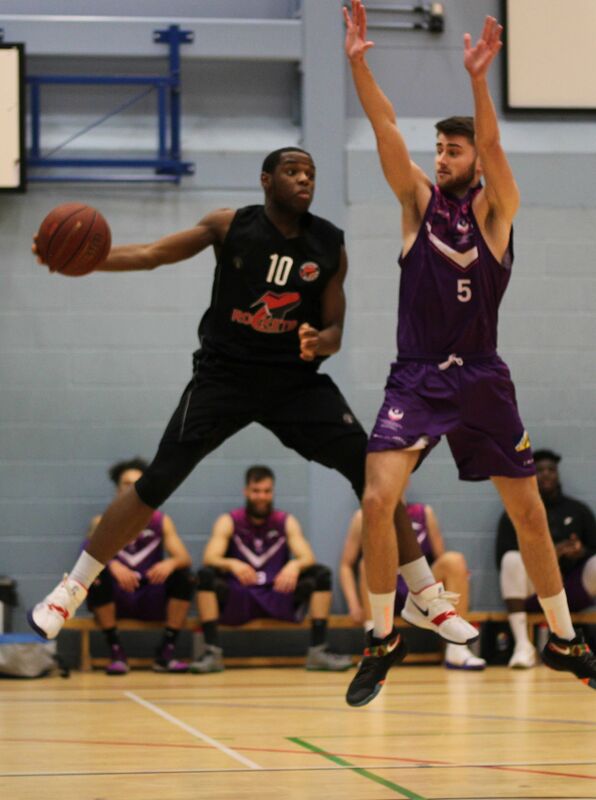 Donaldson and O’Sullivan saw Rockets advantage extended to seven points inside the first minute of this period but Newcastle levelled on 78 by the third minute and went four ahead with a steal and two free throws at 82-78. They extended this lead to 87 -78 with a 16-3 run as Rockets found themselves in team foul trouble. With less than two minutes of normal time remaining g the situation looked dire for Rockets who seemed to now be suffering from the long journey. However young Chive lit up the occasion with five quick unanswered points, Donaldson scored inside and from a pull up jump shot as Rockets went on a 12-3 culminating with a Carr assist and a crucial treble from Donaldson to tie the game at 90 all inside the last minute. Newcastle stroked a treble and appeared to be confident to complete the win but Carter hit a big treble to level on 93. Again Newcastle hit a shot that hit the rim, went high in the air but dropped through the net with only 7.2 seconds remaining. Head Coach Alan Keane called a time -out and Rockets inbounded from the side line to Carter to score off the glass and tie the game at 96 each. Rockets launched themselves as overtime began as they thought this is a long way to come to lose. 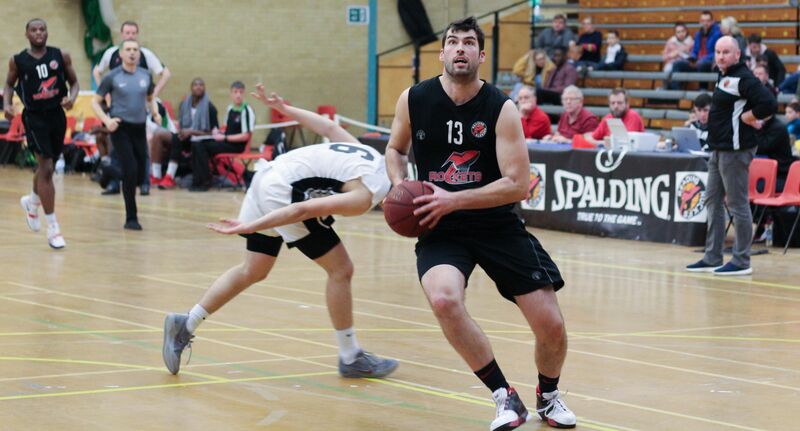 Carter had a tip in and then gave an assist to Carr as Rockets edged ahead by four points. Newcastle were secure from the free throw line but a Donaldson assist to Carr saw him stroke a key treble and edge further ahead. However Newcastle hit a treble but Carter played all of his 6’9” frame to score inside, draw the foul and hit the bonus point to see Rockets 105-100 ahead. A brace of free throws had Newcastle holding on in hope but young David Chive hit three from four from the penalty stripe to lead 108-102 with 1.39 remaining. Again Newcastle came back with a 3-0 run before Donaldson and Pemberton settled this exciting game from the free throw line with four from four and the deserved victory by 112-105 in Rockets first overtime game of the season. The victory keeps Rockets nicely placed for the Play-off Championship qualification as March approaches and Rockets have eight games during the month. Top scorers for Rockets were Sydney Donaldson with 30 points, A J Carr with 28, David Chive with 18 and Danny Carter with 16 of which 10 were crucially in the last 10 minutes of the game.